I always enjoy making decor items and displaying them! Recently we purchased a new stand for the entryway to our house. I’m having a great time decorating the top of that stand. I had patriotic items there and now I’ve switched it over to fall. 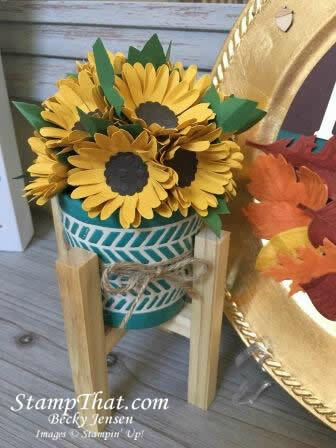 Of course I wanted to incorporate the new Fall Decor piece we are making in class right now! Check out what we are making! We’re in the sunflower making business around here! Aren’t they cute? Have you signed up to make yours? There is still time! We need some new fall décor to spice things up! Keep it for your home/office or give it as a gift! Thursday, September 6, 1:00 OR 6:30 P.M.
Tuesday, September 11, 1:00 OR 6:30 P.M.
Thursday, September 13, 1:00 OR 6:30 P.M.
You may recognize several decor items from the past in this picture. See anything you recognize? I’ve actually made a few changes since taking this picture, but you get the idea of how much fun I have been having. 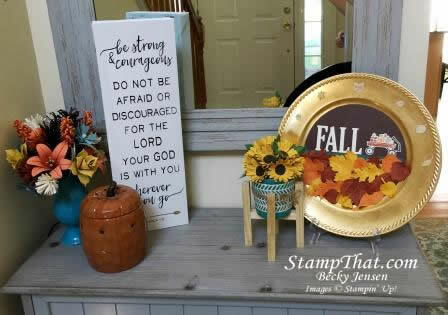 I hope you will join us to make your fall decor!